Reputable billionaire investors such as Jim Simons, Cliff Asness and David Loeb generate exorbitant profits for their wealthy accredited investors (a minimum of $1 million in investable assets would be required to invest in a hedge fund and most successful hedge funds won’t accept your savings unless you commit at least $5 million) by pinpointing winning small-cap stocks. For example our analysis shows that Dan Loeb’s small-cap stock picks returned an average of 45% per year between 2014 and 2017. There is little or no publicly-available information at all on some of these small companies, which makes it hard for an individual investor to pin down a winner within the small-cap space. However, hedge funds and other big asset managers can do the due diligence and analysis for you instead, thanks to their highly-skilled research teams and vast resources to conduct an appropriate evaluation process. 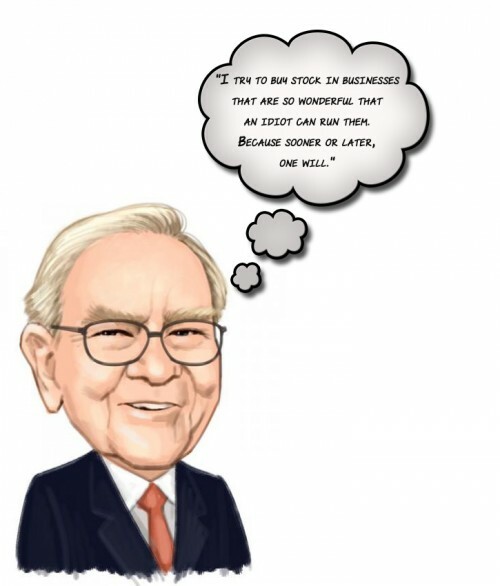 For this same reason, we don’t think it is a good idea to invest in Berkshire Hathaway for individual investors who are looking to outperform the market. Warren Buffett keeps a large amount of cash on the sideline that earn minuscule returns and his large-cap stock picks underperformed the market by nearly 5 percentage points per year between 2014 and 2017 (we don’t think the 2018 performance of his large-cap picks is any better). Warren Buffett spends a lot of time preaching about high hedge fund fees, but he should also tell Berkshire Hathaway investors how his large-cap stock picks underperformed the S&P 500 Index between 2008 and 2017. That’s 10 long years. We agree with Warren Buffett regarding hedge funds. They are exorbitantly expensive and most hedge funds aren’t worth investing in because they aren’t managed by talented managers and/or they have too much money under management (this is actually Warren Buffett’s problem too). Our database shows that 87 of these hedge fund managers had a bullish position in Berkshire Hathaway Inc. (NYSE:BRK-B) shares. In fact Berkshire Hathaway Inc is one of the 30 most popular stocks among hedge funds at the end of 2018. So, why do we pay attention to hedge fund sentiment before making any investment decisions? Our research has shown that hedge funds’ small-cap stock picks managed to beat the market by double digits annually between 1999 and 2016, but the margin of outperformance has been declining in recent years. Nevertheless, we were still able to identify in advance a select group of hedge fund holdings that outperformed the market by 32 percentage points since May 2014 through March 12, 2019 (see the details here). We were also able to identify in advance a select group of hedge fund holdings that underperformed the market by 10 percentage points annually between 2006 and 2017. Interestingly the margin of underperformance of these stocks has been increasing in recent years. Investors who are long the market and short these stocks would have returned more than 27% annually between 2015 and 2017. We have been tracking and sharing the list of these stocks since February 2017 in our quarterly newsletter. Even if you aren’t comfortable with shorting stocks, you should at least avoid initiating long positions in our short portfolio. Before sharing our views regarding Berkshire Hathaway, we’re going to take a look at the latest hedge fund action surrounding Berkshire Hathaway Inc. (NYSE:BRK-B). Heading into the first quarter of 2019, a total of 87 of the hedge funds tracked by Insider Monkey held long positions in this stock, a change of 4% from one quarter earlier. 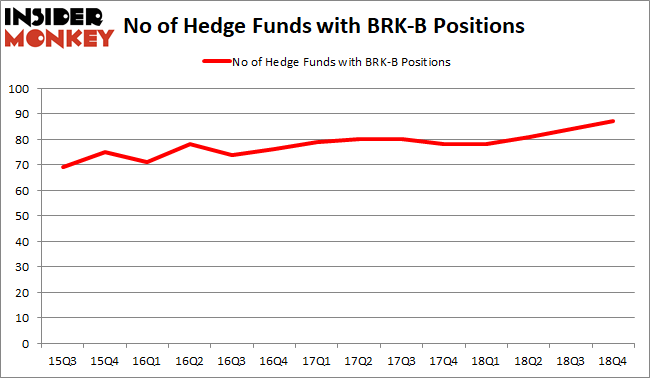 On the other hand, there were a total of 78 hedge funds with a bullish position in BRK-B at the beginning of 2018. So, let’s see which hedge funds were among the top holders of the stock and which hedge funds were making big moves. Now, specific money managers were breaking ground themselves. Voleon Capital, managed by Michael Kharitonov and Jon David McAuliffe, created the biggest position in Berkshire Hathaway Inc. (NYSE:BRK.B). Voleon Capital had $20.4 million invested in the company at the end of the quarter. Robert B. Gillam’s McKinley Capital Management also made a $14.9 million investment in the stock during the quarter. The other funds with brand new BRK-B positions are Ben Levine, Andrew Manuel and Stefan Renold’s LMR Partners, Stephen J. Errico’s Locust Wood Capital Advisers, and Greg Poole’s Echo Street Capital Management. Let’s go over hedge fund activity in other stocks similar to Berkshire Hathaway Inc. (NYSE:BRK-B). These stocks are Facebook Inc (NASDAQ:FB), Alibaba Group Holding Limited (NYSE:BABA), Johnson & Johnson (NYSE:JNJ), and JPMorgan Chase & Co. (NYSE:JPM). This group of stocks’ market values are similar to BRK-B’s market value. As you can see these stocks had an average of 112 hedge funds with bullish positions and the average amount invested in these stocks was $10.4 billion. That figure was $21.4 billion in BRK-B’s case. Facebook Inc (NASDAQ:FB) is the most popular stock in this table. On the other hand Johnson & Johnson (NYSE:JNJ) is the least popular one with only 73 bullish hedge fund positions. Given its size, Berkshire Hathaway isn’t very popular but it is still one of the 30 most popular stocks. Our calculations shows that top 15 most popular stocks among hedge funds returned 19.7% through March 15th and outperformed the Vanguard S&P 500 ETF (VOO) by 6.6 percentage points. Bekshire Hathaway shares gained only 0.1% so far this year. We believe the hedge funds that are invested in Warren Buffett’s company aren’t as talented as the rest. Warren Buffett is probably the best investor of all time, but his stock picks have been average for the last 10 years. The performance of his proteges aren’t very encouraging either. According to Buffett’s latest investor letter, their stock picks underperformed the low cost index funds’ returns as well. These people will be in charge of investing Berkshire’s vast portfolio. If they can’t beat the market by investing a few billion dollars, how can they beat the market investing hundreds of billions of dollars?